He left his body 17 Jul 1987. Like everyone, Maitreya was unique. 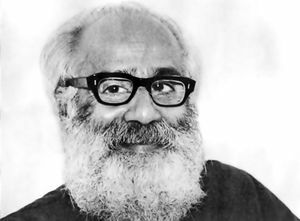 He was at the height of his political career when he met Osho in the early 60s, in his third five-year term (1952, 1957, 1962) as a Member of Parliament in India, though it was said that he was on track for even "greater" things, rubbing shoulders with Jawaharlal Nehru, etc. Meeting Osho derailed that completely. Osho never failed to speak of him in very positive terms. In his time in Osho's communes, Maitreya translated and edited many of Osho's books. Osho says he never missed a moment of going into meditation as much as possible. Maitreya is possibly best known among sannyasins for his part in one of Osho's most celebrated devices: In 1984 at the ranch, Osho named a group of 21 disciples as enlightened. Certain "expected" names were included, some were omitted, and there were also surprises. A few weeks later he announced that it was all just a joke, a device to puff up some egos and see who would do what with it. Two of these 21 were Indian, and had some understanding of what it meant to be enlightened. One of them, Sw Vinod Bharti, went to Osho in tears and begged to be let off this excruciating hook, because he knew he wasn't enlightened. Osho told him to relax, okay, he wasn't enlightened. Maitreya was the other. He just laughed about it and said Osho is really a rascal. Three years later, Maitreya left his body, at which point Osho said he really was enlightened and understood what he had been up to. Osho has also spoken on numerous occasions of the Buddhist concept(s) of Maitreya, a sort of "return of Buddha" in various ways from straight reincarnation to, more generally, a friendly and compassionate bodhisattva incarnating to save all who will listen. And he of course also played with it for a few days as part of his name-change process in 1988-89. But mostly he has spoken of Maitreya as a new paradigm, the master as a friend, a less formal, less hierarchical and less serious form of relating than the old master-disciple game. His giving Mathura this name thus resonates well with the kind and friendly Maitreya that all who came to know him could attest to. This page was last edited on 5 March 2016, at 04:56.